Urethane Impact Bars feature a solid design that prevents belt damage and, together with our highest quality urethane material, provides exceptional impact and wear resistance. This allows Urethane Impact Bars to offer superior belt support, significantly longer life, and lower impact bed maintenance requirements, when compared to rubber impact bars. Solid urethane construction absorbs and cushions the impact load, while providing a contact surface that allows the belt to slide freely, resulting in less wear and tear on your conveyor belt. You will benefit from lower belt and bed maintenance costs. 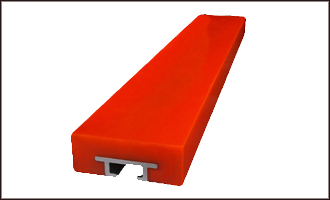 Urethane Impact Bars have been engineered to fit most existing impact bed systems. In addition, Kosin has the ability to custom mold an impact bar to meet your exact needs.